Accessibility is frequently reported in transportation and urban planning studies as an important factor in the location or design of residential neighbourhoods. But, to what extent does accessibility influence residential location decisions of households remains unknown in urban Ghana. This paper uses household surveys and agency consultations to examine the relative importance of accessibility (i.e. 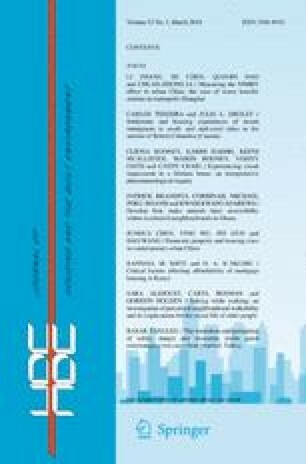 street connectivity, motorability and mobility) in households’ residential location choices in the Adenta Municipality, Ghana. The experiences described by urban households indicate a strong association with accessibility in their location decisions. This implies that areas with poor street connectivity, motorability and mobility will possibly tend to be less attractive to would-be residents. The study further revealed that household respondents do not merely locate in areas just for the sake of it, rather, they are informed by a variety of accessibility attributes among them include cost of travel, proximity to road, street type, distance to work, travel time, proximity to work and traffic-related nuisance. As a result, although many household respondents (59.74%) developed their residential units in areas with limited or no accessibility, they expressed strong appreciation of the importance of, and the need for accessibility in residential neighbourhoods to ensure effective functionality of the municipality, in relation to connecting activity zones such as work places, shopping and recreational areas. Planning implications are further presented.